The Sacramento River is California’s largest and longest river. Most people’s exposure to it occurs in the Sacramento area where it is slow moving through the fields and city or as the broad giant that meanders through the Delta. A smaller but still significant number or people are familiar with the river as it lazily winds its way down the Sacramento Valley. It is a part of the lives of those who live around Redding, where the river passes through the city and still retains a little bit of its mountain character: swift flowing, navigating rapids and so on. Anyone driving up I-5 north of Redding has seen its waters impounded in Shasta Lake and followed its course from Lakehead to Dunsmuir. This stretch of river is raucous and scenic and is rich with wild character. Beyond Dunsmuir they leave the river behind and climb up towards Mount Shasta, the great geographic siren of the Northstate. Shortly after the Interstate and the Sacramento River part ways, the river flows through a very scenic chasm known as the Box Canyon. Upstream a little further it is impounded to form Lake Siskiyou. Further upstream from the lake one can witness the birth of the Sacramento River proper as the three forks forks of the river’s headwaters, the North, Middle, and South Forks, converge to form the river in its fullness. 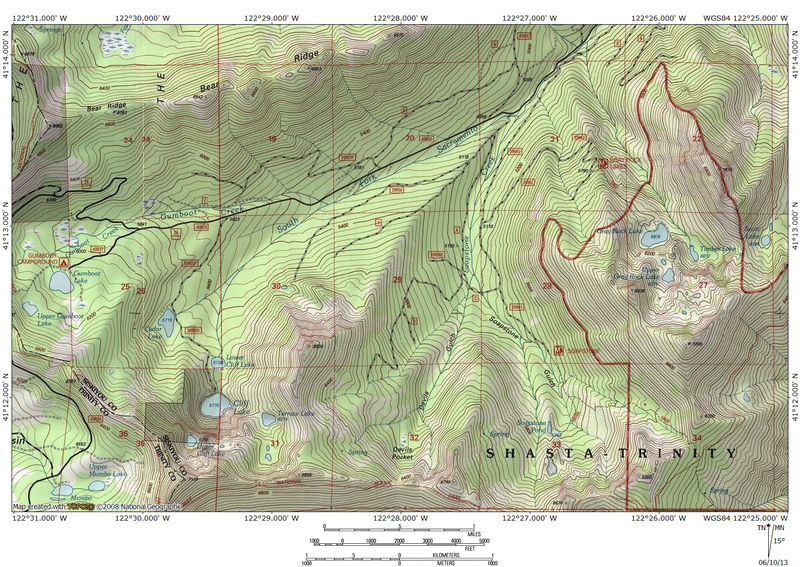 This opportunity is generally unknown to most folks and this is made more obscure by the fact that the large springs at the Mount Shasta City Park are billed as the headwaters of the Sacramento or, at the very least, the “spiritual headwaters”. The Sacramento River, below the confluence of the three forks. 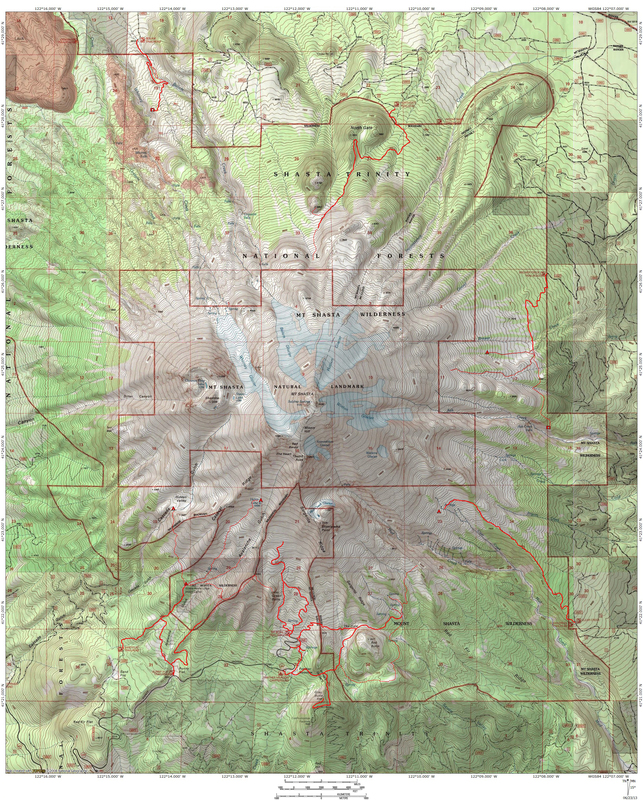 The three forks of the Sacramento that make up its headwaters arise in the Trinity Divide, the eastern breastwork of the great Klamath Mountains. These mountains are on the opposite side of the Strawberry Valley from Mount Shasta. Each fork begins its journey by forming at the head of a deep mountain canyon and tumbling furiously towards their convergence with the other forks. The North Fork is the wildest of the three and the only one not to begin in a lake basin. Instead, a massive complex of meadows gives birth to the river. No roads travel the canyon of the North Fork, which is only accessed by the remote Sisson-Callahan Trail. The Middle Fork headwaters are Porcupine and Toad Lakes. A road does reach up to Toad Lake but it is long, rough and dusty. 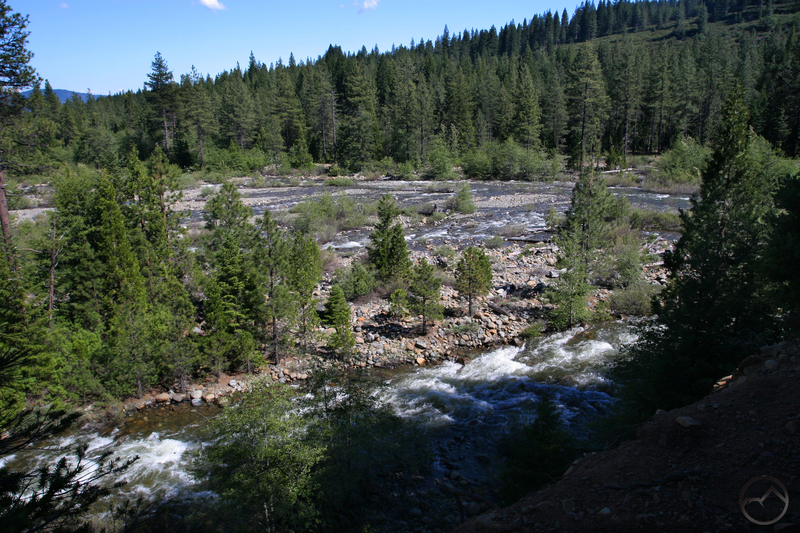 Only the South Fork, which is the largest of the three, is accessed by a paved road. It also has the largest watershed of the three forks and is fed by several lakes from four separate lake basins. These basins, the Gumboot, Cedar (Cliff Lake), Soapstone, and Gray Rock, offer sustained water flow throughout the year from the lakes and the meadows that surround them. The presence of so many lake basins means that the South Fork of the Sacramento also has the most diverse hiking options. Two of the basins in particular, Cedar and Gray Rock, have great trails that lead to numerous highly scenic destinations. There is also a lot of potential for off-trail exploration in both of these lake basins. Headwater of the South Fork of the Sacramento River. The easternmost of all the lakes in the South Fork area, the Gray Rock Lakes are nestled into a broad bowl. The entire basin was included in the Castle Crags Wilderness when the wilderness area was established in 1984. Unlike the Castle Crags, which are a classic granite formation, the rocky bowl containing these lakes is formed of a gneiss intrusion. The two types of rocks are related, but gneiss does not have all of the components of granite, such as mica, and is prone to banding (parallel layers in the rock). 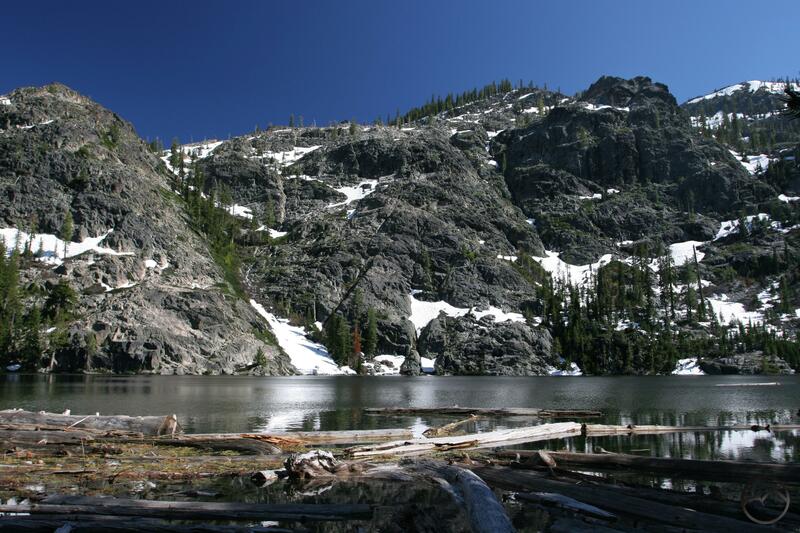 Three lakes are found in the Gray Rock basin: Gray Rock, Upper Gray Rock and Timber Lakes. 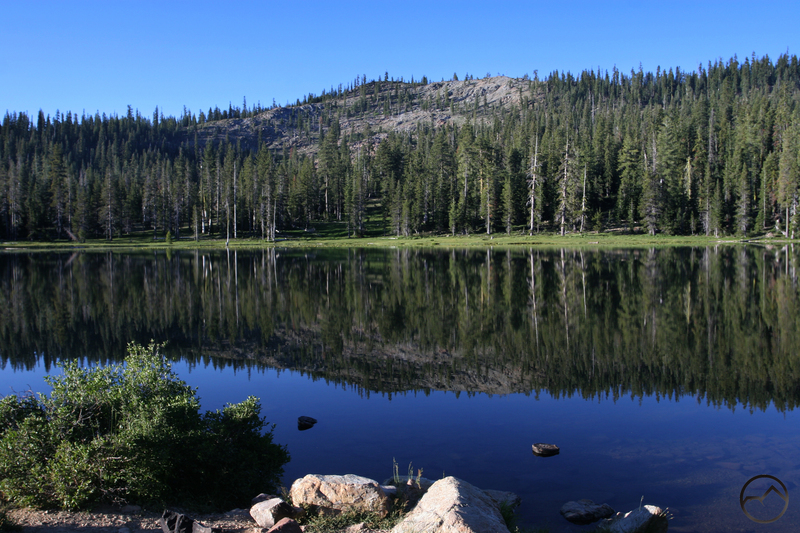 There are also a few unnamed ponds, most of which are near Upper Gray Rock Lake. Two high peaks, Gray Rock Dome and Harry Watkins form the eastern and southern walls of the basin. The short Gray Rock Lake Trail traverses the canyon wall above the outlet creek. Gray Rock Dome looms prominently on the opposite side of the canyon. Once the trail drops down to Gray Rock Lake, there are a few different options. Paths lead to the upper lake and Timber Lake. Upper Gray Rock Lake is in a scenic bowl with attractive cliffs above it. Timber Lake has the most extensive meadows in the basin. Routes leading to the two aforementioned peaks depart from the lakes. The last 0.25 miles of the road leading to the trailhead is a bit rough so those without high clearance vehicles may want to park when the road degrades and walk to the trailhead. Looking down on the Cliff Lakes. The largest of the lake basins that feed the South Fork of the Sacramento, Cedar Basin is home to Lower Cliff Lake, Cliff Lake, Upper Cliff Lake as well as Cedar Lake and Terrace Lake. Numerous unnamed are tucked into rocky corners of the basin as well. These lakes are the ultimate source of the South Fork. It is fitting that the South Fork begins in such dramatic fashion. Water from Upper Cliff Lake and Terrace Lake cascades noisily into Cliff Lake, flowing down the massive cliff that rises out of the lake’s southern end. Cliff Lake’s cliff is one of the most dramatic features found anywhere in the Trinity Divide. Unlike the Gray Rock Lakes, Cliff Lake is accessed by a road rather than a trail. The road is very rough and is more easily hiked than driven. There is a trail leading from Cliff Lake up to Terrace Lake. From there, numerous smaller, unnamed lakes can be reached. The prettiest of these is tucked into a bench in Cliff Lake’s cliff. It is reached from Terrace Lake. Nearby there is a rough route leading down to spectacular Upper Cliff Lake. The west part of Cliff Lake is privately owned. A couple cabins occupy the site. Be sensitive to the owner’s rights. There are two other basins that feed the South Fork. In terms of area, the Soapstone Basin is the largest but it only has two small ponds, only one of which does not dry up late in the season. There is a trail that climbs into the basin and eventually accesses the Pacific Crest Trail. Further up the South Fork Canyon are the Gumboot Lakes. The paved road reaches all the way up to the shores of Gumboot Lake where there is a small campground. Meadows ring the main lake while Upper Gumboot Lake is a bit rockier. These lakes are subtler than the Gray Rock and Cliff Lakes and lakes the large cliffs that give the others their impressive appearance. A short trail climbs above the lakes and connects to the Pacific Crest Trail at Gumboot Saddle. 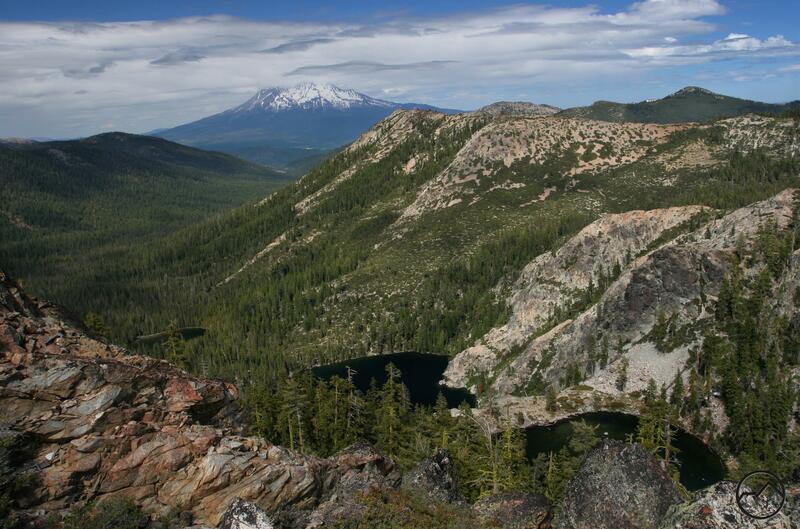 If camping at the lake, this trail, combined with a short section of the PCT to the south of the saddle leads to a fantastic vista overlooking the lakes with a great view of Mount Shasta. Is there water up in the Pecos Wilderness? Oh, I’m sure there is but haven’t had the opportunity to hike up there yet. Had a number of hikes planned but had to cancel all of them because they closed the Pecos Wilderness a few days ago due to fire danger. Would love to hike up there but haven’t hiked that far north of ABQ, yet. Beautiful area. Have only backpacked in the Marble Mtns. 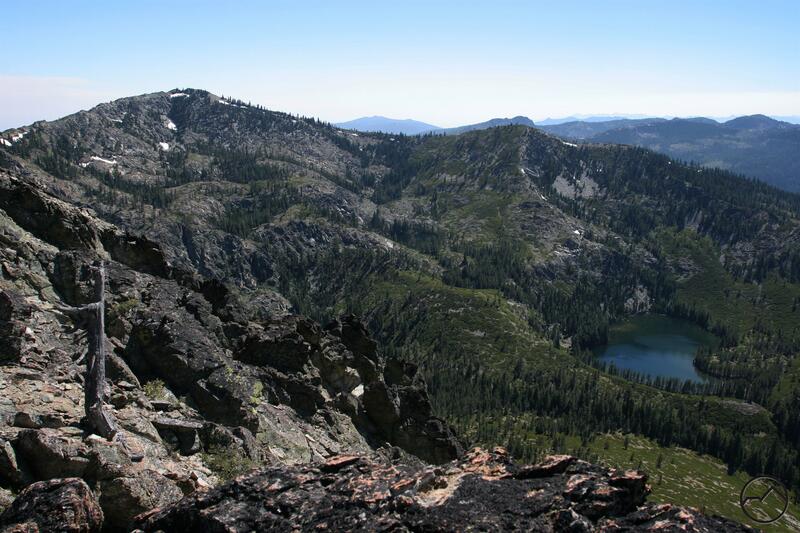 Would love to do the Trinity Alps, and Cliff Lakes looks like a great hike too. Thanks for the info.